Jerry Denton was born on July 15, 1924, in Mobile, Alabama. He entered the U.S. Naval Academy in June 1943, and graduated with the Class of 1947 on June 5, 1946, earning his commission a full year early due to the demands of World War II. His first assignment was as a Communications Officer aboard the aircraft carrier USS Valley Forge (CV-45) from June 1946 to January 1948, followed by Lighter-Than-Air Training with Airship Patrol Squadron 2 (ZP-2), receiving his designation as a Lighter-Than-Air Naval Aviator on October 1, 1948. LtJg Denton served as a Tactics Officer with ZP-2 at NAS Glynco, Georgia, from November 1948 to April 1950, followed by service as an Airship Test Pilot with the Chief of Naval Airships Training and Experimentation from April 1950 to April 1952. Lt Denton next completed Heavier-Than-Air Fixed-Wing pilot training, earning his designation as a Naval Aviator on October 1, 1953, and then served as a WV-2 Warning Star pilot with VW-2 at NAS Patuxent River, Maryland, from October 1953 to June 1956. During this time, he also served as a Project Officer and Test Pilot with the Naval Air Test Center at Pax River. His next assignment was as an Air Defense Officer on the staff of the Commander U.S. 6th Fleet from June 1956 to July 1958, followed by Armed Forces Staff College at Norfolk, Virginia, from August 1958 to January 1959. 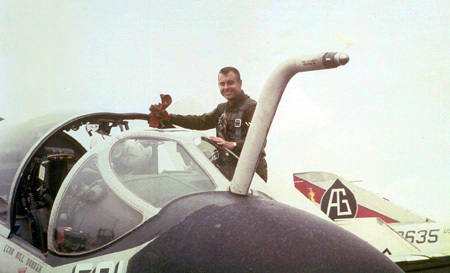 LCDR Denton served as a Flight Instructor with VT-22 at NAS Kingsville, Texas, from January 1959 to August 1961, and then attended A-1H Skyraider transition training with VA-42 at NAS Oceana, Virginia, from August 1961 to January 1962. CDR Denton next served as Executive Officer and then Commanding Officer of VA-75 at NAS Oceana from January 1962 to August 1963, followed by Naval War College at Newport, Rhode Island, from September 1963 to June 1964. He then completed A-6 Intruder Replacement Air Group training with VA-42 at NAS Oceana from July 1964 to February 1965, before serving as an A-6 pilot and Operations Officer for CAW-7, and as Prospective Commanding Officer of VA-75, from February 1965 until he was forced to eject over North Vietnam and was taken as a Prisoner of War on July 18, 1965. After spending 2,767 days in captivity, Capt Denton was released during Operation Homecoming on February 12, 1973. He was briefly hospitalized at the Naval Hospital in Portsmouth, Virginia, and was assigned to the Commander, Naval Air Forces U.S. Atlantic Fleet, from February to December 1973, and then served as Commandant of the Armed Forces Staff College in Norfolk, Virginia, from January 1974 to June 1977. RADM Denton's final assignment was as Special Assistant to the Chief of Naval Education and Training at NAS Pensacola, Florida, from June 1977 until his retirement from the Navy on November 1, 1977. After his retirement from the Navy, Jerry served as a consultant to the Christian Broadcasting Network from 1978 to 1980, and was a U.S. Senator from Alabama from 1981 to 1987. In 1976, ADM Denton published a book titled "When Hell Was in Session", which details his experience as a Prisoner of War. Jerry Denton died on March 28, 2014, and was buried at Arlington National Cemetery. For extraordinary heroism while serving as a Prisoner of War in North Vietnam from February 1966 to May 1966. 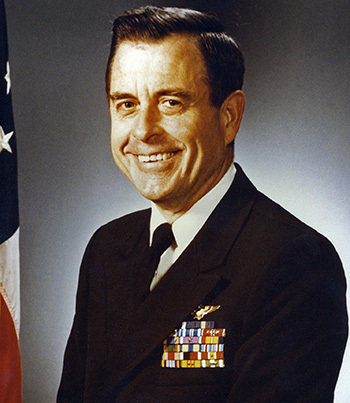 Under constant pressure from North Vietnamese interrogators and guards, Rear Admiral Denton experienced harassment, intimidation and ruthless treatment in their attempt to gain military information and cooperative participation for propaganda purposes. During this prolonged period of physical and mental agony, he heroically resisted cruelties and continued to promulgate resistance policy and detailed instructions. Forced to attend a press conference with a Japanese correspondent, he blinked out a distress message in Morse Code at the television camera and was understood by United States Naval Intelligence. When this courageous act was reported to the North Vietnamese, he was again subjected to severe brutalities. Displaying extraordinary skill, fearless dedication to duty, and resourcefulness, he reflected great credit upon himself, and upheld the highest traditions of the Naval Service and the United States Armed Forces. CDR Denton with his A-6A Intruder aboard the USS Independence in 1965.